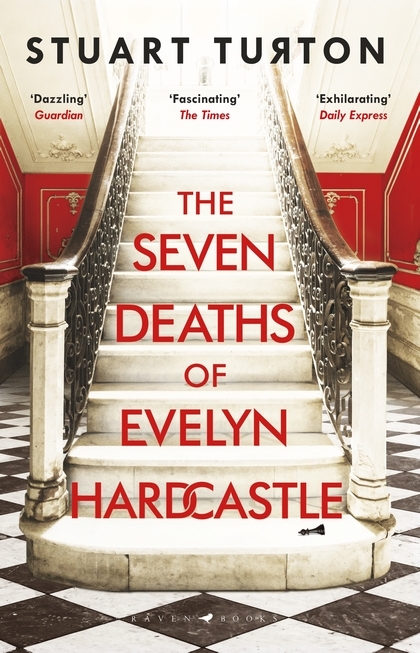 🌟 This is part of the synopsis: Evelyn Hardcastle will be murdered at 11:00 p.m.
🌟 This is one of the times that I read the books based on the synopsis only and the cover was not appealing to let me read the book. This mixes two of my favorite Genres: Fantasy and Mystery/ Thriller so I knew I had to read it. 🌟 You are thrown into the book and you’re suddenly confused as the main character is confused to begin with. This confusion decreases as you progress and start getting hints and clues with each and every chapter. But it was kind of paradoxical, I was confused then not then as we are introduced into more hosts I was really confused and the last 10 chapters makes thing clear again. The author describes the book as time-travel, body-hopping, murder-mystery novel. While I was reading this many asked me what it was about and when I explained then they said what a headache!! 🌟 So this book is definitely not for everyone, I am one of those people who like time-travel a lot but I am easily confused by it and though I got the majority of this book, I didn’t understand everything tbh. If you are one of those people who is easily confused then you can pass this book. 🌟 The writing was good but nothing special, It didn’t stand out among all the other “good” writing styles that I read before. 🌟 The characters were unique and I really loved what the author did with the body-hopping and how the MC is affected by them, I enjoyed the notion that we sometimes criticize people but we can’t relate to them and if we were in their place, in their bodies we would have done the same, that was a really genius concept!! 🌟 The mystery part was not the best I ever read, it may have been lost with all the other things going around. I wanted to know what happens next but not caring much about the murder part! 🌟 The ending was a bit over the top and not very satisfying for me, I expected a bit more with all the hype surrounding this book. I think that this book may get a sequel or something judging from that ending. 🌟 Summary: A book with a great concept and good execution but it can be really confusing if you don’t concentrate enough, this is not an easy and a light read, it may even be better to take notes or draw a timeline for the story to get everything. I know it was hard to read and thus it should have been harder to write and I appreciate that. It was mostly a 3 stars read for me but the last chapter improved it and it jumped to 3.75 stars! I still prefer easier reads as Agatha Christie books where it is an easier case with more clues and less confusion. 🌟 Prescription: For fans of both Mystery/ thriller books and time traveling. If you are looking for a mind-twisting novel then this is for you. The majority of readers liked it so it may be worth the chance! I really loved this one because it was so different than anything I’ve read this year. BUT I will agree with you that it takes A LOT of concentration. You pretty much have to devote all your attention to it and if it takes you longer than a couple days to read you’re just going to forget stuff. Great review. I’m glad you liked the ending – that seemed to be a lot of people’s least favorite part but I liked it as well. I may re-read it in the future with a keener eye but not happening anytime soon! You know I loved the hell out of this book, but I absolutely agree with you & Becky that this is a book that requires a lot of attention and won’t be for every reader. Great review! I am really glad you liked it! I read it because of you tbh!! I found a 5 stars read by the way! It’s a cerebral mindfuck, lolol. I actually wonder if it would be fun to re-read, I am thinking it might be. I’ve been wanting to read this book for a while now! I’m so glad you enjoyed this!! I got about 75 pages in and didn’t really get sucked in. I was also forcing myself to read it when I shouldn’t have. I had to let it go back to the library. Maybe… I’ll give it another go sometime.